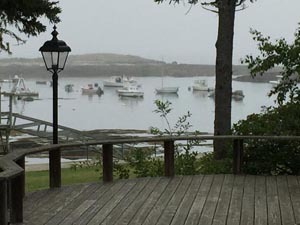 Rachel Carson’s summer cottage in Southport, Maine sits amidst spruce and pine atop a rocky bluff overlooking tidal pools and gulls and lobster boats. Like Carson, the cottage seems reserved, a bit old-fashioned, occasionally lonely. But to enter this pine-paneled stretch of rooms with its picture windows to the sea and sunsets is to discover Rachel Carson’s sense of wonder, her ability to imagine the genesis of the oceans, the evolution of living creatures, her feeling of awe in the face of such majesty and mystery. And you find here the sources of her love. You discover Rachel’s constant surprise and joy in the small sights and sounds in the woods through which she rambled with her son Roger when he was just a toddler. She scurries down the slope with him bundled in a blanket to feel a storm and surging tides. She delights in bunchberries, the tiny wildflowers that look like fairy-sized dogwood trees, the crunch of reindeer moss, the plaintive evensongs of the wood thrush, Hermit Thrush (click media player below) and veery. Here at her home that she called “Silverledges,” the pull of the moon is palpable, audible in the shifting tides. I slept with windows open at the full August Sturgeon Moon when the Sheepscot Bay, a long inlet to the sea, rolled and roared against the rocks. Scientific terms like gravity and erosion and sea-level rise now come alive. The power of these ancient forces fascinated Carson whose writing captures the effects of the elements over eons in creating the world in which we and other living things have evolved and adapted or passed away. 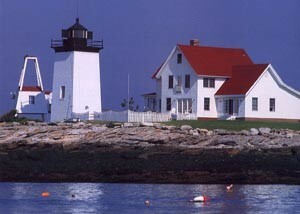 The natural world is more evident, more encompassing, here on the coast of Maine. Amidst the cry of hunting gulls, the fishing of the cormorants, the diving eider ducks whose down protects them from the cold, humans seem less central to things, more dependent on the weather and the tides. My first morning was encased in fog, cool and damp, with shapes blurred at the edges, if visible at all. I first heard the low, putting rumble of a small lobster boat and strained to see through binoculars the sole lobsterman on the “Diane” move to each buoy and slowly winch up the metal traps. Plaid shirt, orange rubber jump suit, stout gloves, a simple cap, he worked carefully in the fog, examining each lobster as if it were a painting or a jewel. Maine regulations require that young, undersized lobsters be returned to the sea. The same is true for the large, wise old lobsters which are thrown back as well. I see my lobsterman look gently beneath the tails and put back any pregnant females carrying precious eggs. At this speed and scale, lobstering seems sustainable, almost serene. The human desire to play, to explore, to frolic is also visible at the edge of the sea. There are seals in the waters beneath the Carson cottage and whale and puffin trips at nearby Boothbay Harbor. We watched huge, ninety foot-long fin whales spouting and diving, true leviathans who weigh up to 160,000 pounds. But it was the racing, jumping, shimmering forms of several large pods of Atlantic white-sided dolphins that brought cheers, smiles and laughter from the humans, large and small, aboard our boat. There is some strange kinship here between mankind and these breathing creatures of the sea that has been noted since the days of myth and legend. That same joy and laughter comes up now from the rocks and tidal pools below the cottage as three small boys jump from rock to rock and wade into the pools looking down and feeling for the myriad, miniature life forms beneath their sneakers. Only when the sun sets with streaks of burnt orange across the water do these young, curious mammals head toward home with a few small souvenirs from the shore. 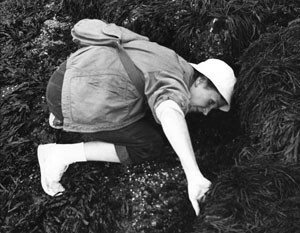 I, too, jumped and slipped on rockweed-covered granite, laughed, and waded into Rachel and Roger’s tidal pools at their house, at the small town beach near the Hendricks Head Lighthouse, and at Ocean Point where Rachel Carson spent many hours with her friend, Bob Hines, a nature artist for the U.S. Fish and Wildlife Service, collecting, and then returning, specimens that he used for the illustrations of her 1955 best seller, The Edge of the Sea. As the tide ebbs, I bend, as Rachel did, and pull aside the matted seaweed that covers small rocks and offers shade and shelter to a tiny world of living things. Periwinkles, small snails attached to the rocks, abound, as do their shells upon the rocky beach. There are lines of purplish mussels sticking in crevices, some with barnacles on their sides. The tiny, hard off-white cones of barnacles are everywhere. Through clear sea water, I watch transfixed as a barnacle the size of a freckle waves its legs, or cirri – living, minuscule feathers that strain and catch plankton and other food invisible to the naked eye. Beneath the side of another rock, I find a row of sea anemones, miniature, pinkish brown tree stumps attached to the rock with a spray of pink tentacles gently swaying at the top. The largest is perhaps three to four inches high, while others spread out from it on either side diminishing to less than an inch in height and width. When gently touched, the sea anemone retracts into a rounded, brown lump with only a ring to indicate where it had just shown its tentacles. In this small world, of lacy red sponges and minute swarms of wiggling, gray larvae forming and reforming tiny circles less than an inch across, a small crab seems a mighty, armored, if amusing, creature as it scuttles off sideways beneath the nearest rock. Rachel Carson studied sea water and seaweed and sea creatures under a microscope in her cottage. But she saw them all as woven into a larger pattern of life in which each part, each piece is connected and worthy of our reverence and our awe. 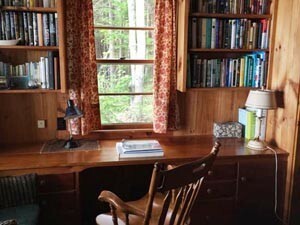 Rachel then wrote her marvelous blend of science and spirituality at the cottage in her book-lined study with its views of both sea and woods. Much of The Edge of the Sea and her story about teaching children to wonder with pictures of Roger that ran in The Woman’s Home Companion and was published posthumously as A Sense of Wonder was written here. And it was in this study, too, that she labored over Silent Spring as she struggled with metastasizing breast cancer and the realities of her limited, remaining days in her final summer with the fog and tides and birds and people that she loved. Derided by her corporate and conservative critics as a spinster and a pseudo-scientist, Rachel Carson found refuge and renewal in Maine. And she found and gave much love that is the true hallmark of her writing and her ethic. Here she cared for her aged mother, adopted her orphaned grandnephew and taught him a sense of wonder. She hosted and entertained friends and colleagues in her cottage – her friend and agent Marie Rodell, her fellow activist Marjorie Spock, her research assistant Jeanne Davis, her naturalist partner Bob Hines, Shirley Briggs, who took photos of Rachel and carried on her work through the Rachel Carson Council, and, of course, her close friends and neighbors from nearby Dogfish Head Road, Stan and Dorothy Freeman. With Dorothy, her most intimate friend, Rachel could pour out her fears, her pains, her frustrations. But mostly, in person and in correspondence, she had the affection of a soulmate who was both supportive and shared Rachel’s endless love and wonder for nature, for the Lost Woods they tried to save, and for all the beauties at the edge of the sea. Rachel and Dorothy often went to the Newagen Inn near Ocean Point where Rachel would write and where they sat and soaked up the serenity of the shore. In their final fall together in 1963, Rachel and Dorothy marveled at the migration of monarch butterflies at the Inn, their beauty, fragility, endurance and their passing. Knowing she was dying, Rachel Carson wrote to Dorothy of their precious time together. “But most of all, I shall remember the Monarchs…” When Rachel Carson finally succumbed to breast cancer, Dorothy spread her ashes to the sea at the rocky edge of the Newagen Inn. A bronze plaque found at the end of the sunset path now marks the spot. A young innkeeper proudly takes me to it. Rachel’s books and signed copies of those about her are displayed inside the inn along with a framed copy of her letter to Dorothy on a small table that is an altar. The gardener outside speaks with me about Rachel and his own love of beauty, the flowers, bees, and butterflies. He carries on, two generations after Rachel Carson, now planting and tending milkweed so the monarchs will still return. The procession of the seasons and of the ages, imagination, awe, wonder, nature, love. All these still abide at Rachel’s cottage by the sea and with the places she held dear. Photos by Bob Musil. Photo of Rachel Carson by Shirley A. Briggs, from the Rachel Carson Council collection.